Posts tagged with "task management"
Apple's Reminders is one of the few native iOS apps with a database that can be directly tapped into by third-party clients. 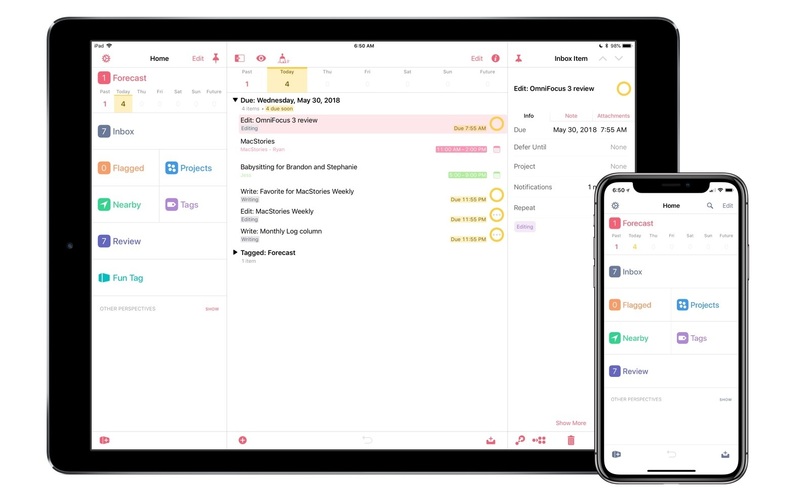 Like the iOS Calendar app, which has no shortage of alternatives on the App Store, developers can create their own task managers that fully integrate with your Reminders database, offering the convenience of a built-in system with the benefit of having multiple options to choose from. A couple months back I wrote about two of the best third-party Reminders clients on the App Store, one of which was Reminder. Today as part of its big 3.0 update, Reminder is being renamed Memento and bringing a handful of improvements that take better advantage of Apple's full device ecosystem. There's an Apple Watch app for the first time, keyboard shortcuts on iPad, 3D Touch shortcuts on compatible iPhones, custom time presets, and more. This fall when macOS Mojave introduced a systemwide dark mode feature, Things added support for the new mode in version 3.7. The iPhone and iPad versions of the app, however, were left out. A lack of feature parity across platforms is always unfortunate, but that was especially true this time around because our John Voorhees highlighted Things as having his single favorite dark mode implementation. There's good news though: we didn't have to wait long for Things’ dark mode to make its way to iOS. Launching today in version 3.8, Things has added two different dark modes on both iPhone and iPad, one of which is suited particularly well to OLED iPhones. Accessible via a new Appearance screen in Things’ Settings, there are now options for Light, Dark, and Black modes for the task manager. The former is the default appearance of the app we’re all well acquainted with, while the latter two are brand new. Both alternate appearances employ blue as the app’s accent color, with the main difference being the background color. Dark mode uses a nice shade of gray, while Black mode employs an OLED-optimized true black. Each of Things’ appearance options can be set manually, or there's an option to have the app switch modes automatically depending on your display's brightness. Once you activate this toggle, you'll see an option to choose between Dark and Black options for automatic switching, as well as a brightness threshold at which Things will change its appearance. The app’s use of display brightness to change modes should work well for users who have iOS’ Auto-Brightness feature activated, but I wish there was an automatic switching function for those who, like me, have that turned off. Things 3.8 doesn't introduce any other new features, but adding two beautiful dark modes is enough to make this a noteworthy release. Cultured Code has a strong reputation for thoughtful design, and its dark modes are a standout example on iOS. Things 3.8 is available on iPhone and iPad. Apple has long prided itself on being a company that carefully weaves hardware, software, and services together to offer a holistic user experience. Because of this, every purchaser of Apple products benefits from the built-in apps and services that accompany those products. And on the two most popular sellers, the iPhone and iPad, one of those bundled apps is Reminders. At its core, Reminders is a simple list and to-do app that can be surprisingly powerful thanks to features like repeating tasks, location-based reminders, collaborative lists, and note support. Many times over the years Reminders has been my primary task manager and served me fairly well. It may not be as capable as alternatives like Things, but the app remains an appealing tool for those whose needs are light, and who value the ease afforded by Apple’s built-in ecosystem. Unlike most of Apple’s other iOS apps, Reminders is built on a framework that’s accessible to third-party developers. Though developers can’t build apps that hook in directly with your Messages or Notes databases, Reminders is a different story. The underlying system powering Reminders is calendar-based, meaning it’s not tied to a single first-party app. Just as Fantastical and Timepage offer access to your existing iCloud calendars, developers can similarly build entire replacements for the Reminders app utilizing your existing collection of lists and to-dos. Two such apps, Reminder and GoodTask, serve as perhaps the best third-party Reminders clients on the App Store. 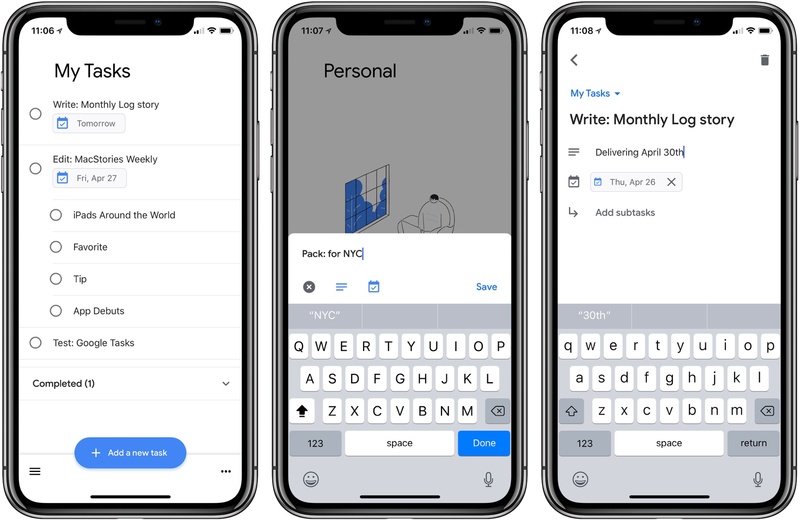 Each app takes a different approach to enhancing Reminders, with one focusing on modern design while the other offers power user features and flexibility; both, however, retain some of the benefits of staying in the Apple ecosystem while improving upon the first-party Reminders app. 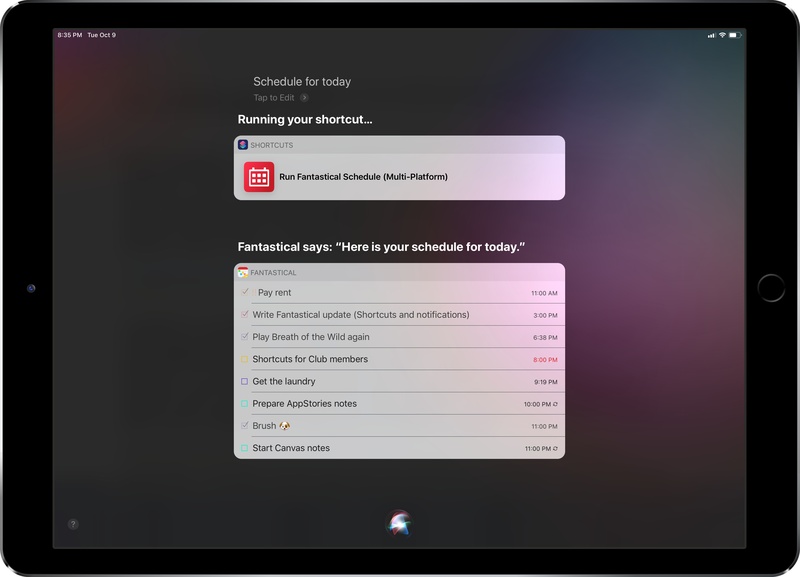 Fantastical was updated last week to version 2.10, which brought support for some of the key features of iOS 12 and watchOS 5 – namely Siri shortcuts and complications for the Infograph watch faces. I want to highlight some of the changes in this release and how they fit my usage of Reminders as my main task management system. Today Cultured Code launched the latest update to Things, version 3.7, on iPad, iPhone, and Apple Watch. The app's headline feature is full support for Siri shortcuts, but it also brings welcome improvements in a few other areas: integration with the Apple Watch's Siri face, landscape support on iPhone which includes the iPhone X, dynamic notifications, and more. Taken together, it's a broad set of enhancements that takes full advantage of all the latest APIs Apple has to offer. My task manager is packed with personal and work tasks. I rely on it to keep me on track day-to-day and week-to-week. The reason my task system works though is that it doesn’t include absolutely everything. If I started adding the minute-to-minute minutiae of life, I’d get bogged down in the volume of tasks each day. For a while now, I’ve been using Apple’s Reminders app to keep track of one-off tasks, little things I might forget to do, errands, and tasks with deadlines. I’ve found that it’s a great way to stay on top of items that don’t have a home in a formal project. For the past couple of weeks though, I’ve largely replaced Reminders with Due, which was updated to version 3.0 today. If you're anything like me, you probably remain perpetually dissatisfied with your task management setup. You may have chosen an app and settled in with it, but some of its design choices don't quite fit with your way of working, so you're always keen to try the latest and greatest app that comes along. Realistically though, you've resigned yourself to the fact that the "perfect task manager" doesn't exist, and likely never will. Task management is a tough problem to solve, because every option out there is optimized for specific use cases, resulting in different complexity levels. Some aim to remain simple and user-friendly, while others try to put every tool at your disposal, endearing themselves to power users while scaring off prospective customers who need a bit less. On this complexity spectrum, OmniFocus has historically been the poster child for the weightier end: if you have a lot of complicated projects that need a high degree of structure, there's no better place to start than OmniFocus; however, for lighter needs, I've always found its myriad of options too overwhelming to recommend. 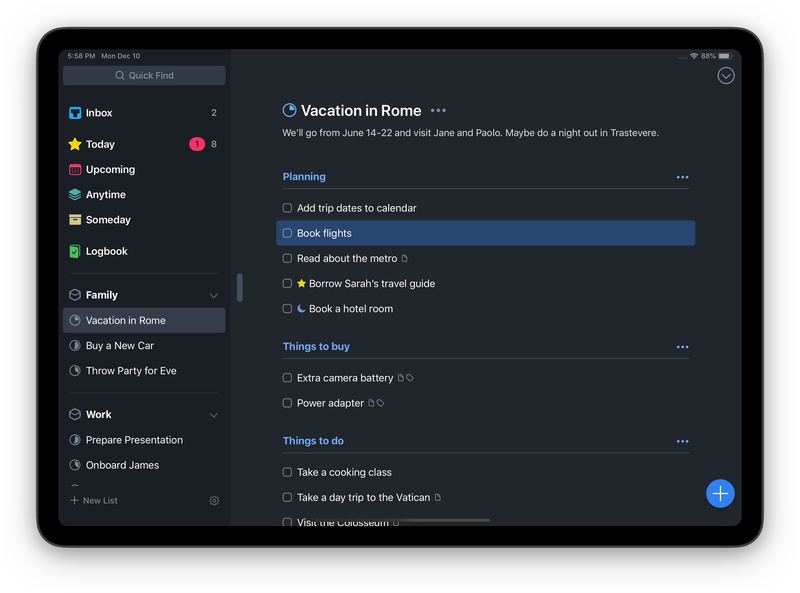 OmniFocus 3, released today for iOS (and later coming to the Mac), adds even more power and options to the app's existing toolset, yet rather than growing more complex in the process, it's surprisingly become more approachable. This improved user friendliness is achieved thanks to a new level of flexibility that can, upon tweaking your ideal setup, obscure the app's complexity in everyday use. In more ways than ever before, OmniFocus provides the tools to make the app your own. 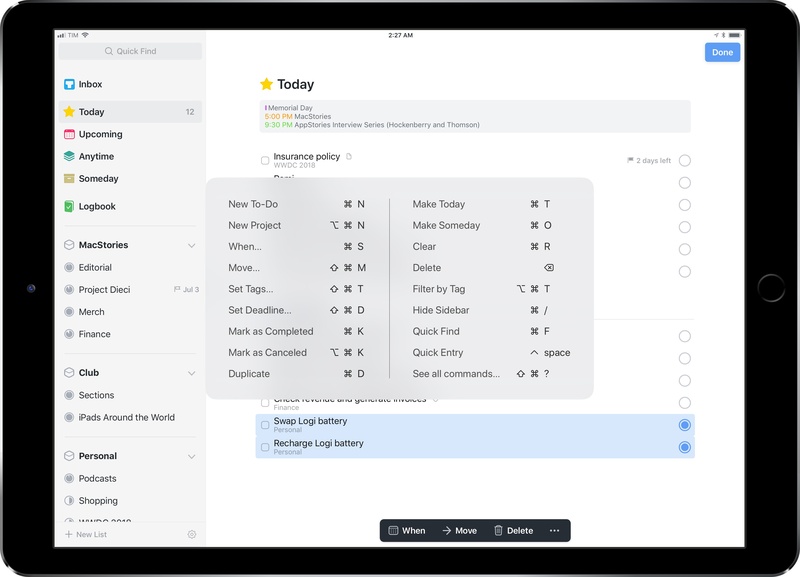 Outside of a lovely new design, where icons and fonts are bolder and everything feels more fresh, my favorite changes in OmniFocus 3 are this increased flexibility, which encompasses a lot of new and updated features, and its excellent iPad improvements. Let's dive in. Despite Apple's message that the iPad Pro can be a viable PC replacement because, among other features, it natively supports a dedicated external keyboard, its software still isn't fully optimized for keyboard control. This isn't surprising at all: iOS was designed with multitouch in mind; as long as the iPad shares a common foundation with the iPhone, it'll always be first and foremost a touch computer. The iPad Pro line, however, is nearing its third anniversary, and its external keyboard integration still feels like an afterthought that's hard to reconcile with the company's marketing. Take multitasking for example: after three years, Split View, one of the iPad's marquee exclusive features, still can't be controlled from an external keyboard. If you buy an iPad Pro with a Smart Keyboard and assume that you're going to be able to assign an app to a side of the Split View, or maybe resize it, or perhaps change the keyboard's focus from one side to another...well, do not assume. As much as Apple argued against vertical touch screen surfaces in laptops years ago, the iPad Pro ended up in this very situation: if you want to take advantage of all the great features iOS 11 offers to pro users, you will have to take your hands off the Smart Keyboard and touch the screen. There are dozens of similar instances elsewhere in iOS. For the most part, the iPad treats external keyboards as inferior, bolt-on input devices. It's with this context that I want to cover Things 3.6, a major update to the task manager's iPad version that gives us a glimpse into what Apple could do with external keyboard control on iPad if only they understood its potential. I've been able to play around with Things 3.6 on my iPad Pro for the past couple of weeks. This isn't another "keyboard-centric" update that only adds a handful of shortcuts to trigger specific commands. Instead, the developers at Cultured Code have focused on an all-encompassing keyboard control framework for the whole app, from task lists to popovers and multiple selections. With version 3.6, Things has the best implementation of external keyboard support I've ever seen in an iPad app. Google Tasks is a service many Google users may be unfamiliar with. Historically it's been a somewhat hidden feature of Gmail and Google Calendar, but today alongside a redesign of Gmail, Google is helping Tasks break out and receive slightly better treatment with the launch of a new iPhone app. I have to say up front: if this app wasn't a Google property, tied to an existing Google service, it likely wouldn't merit much attention. Essentially it's a barebones home for task lists, with a couple small task manager-like functions. Each task you create can include additional details in a note area, be assigned a due date, and can include embedded subtasks. And that's basically it. You can create multiple lists to store your tasks, but there's not even a smart list that consolidates all your tasks containing due dates. I struggle to see who Tasks is for with this first version, and hope it's quickly iterated upon. If you're deeply invested in the Google ecosystem, and have very minimal task needs, but want something integrated with Google's other products, I guess Tasks could be for you. But only on the iPhone; there's no iPad version at this time. Google Tasks is available as a free download on the App Store.